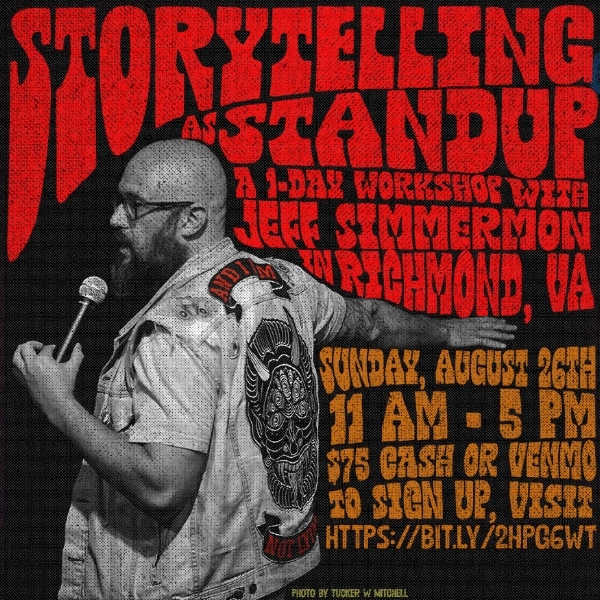 On August 26th, 2018, Jeff Simmermon will teach a one-day workshop for both new and experienced comics and storytellers, to teach the structure and technique of comedic storytelling. When a comic tells a bunch of jokes, you remember those jokes. But when a comic tells a hilarious story - you remember the COMIC. When a storyteller tells a story without jokes, they run the risk of losing the audience. But a touching, sad story with laughs along the way is one that gets repeated. AND: The best comics are spectacular storytellers. The best storytellers know how to entertain an audience. Stand-ups and storytellers have a lot to teach each other. The goal for this workshop is to spread some knowledge from each side of the fence to the other. WHO TEACHES: Jeff Simmermon, a Moth Grand Slam winner, appeared on This American Life and The Moth’s Radio Hour/podcast. See his live stories here. His writing has appeared in The Paris Review’s blog. His album "And I Am Not Lying" debuted at #1 on the iTunes comedy charts. WHAT IS IT: A one-day comedic storytelling workshop. WHEN: August 26th, 2018 from 11:00-5:00 PM (30 minute break at 2pm). WHERE: We're looking at two different places in Shockoe Slip right now. Todd Sentz will email the precise location to everyone the during week before the workshop. WHY: Because you’re funny but want to learn story structure. Or you’re a storyteller who loves Mike Birbiglia, Spalding Gray, and realizes that funny stories are the ones that you want to tell. HOW MUCH: $75, payable in cash or Venmo to Todd Sentz. 1) Click HERE to pay. You cannot be signed up for the class until Todd has received payment in full. I've tried the installment plan and it gets really weird, so I've got to stand by this. 2) Write me at the contact form on my website, and put ‘storytelling workshop RVA’ in the subject line. Let me know a little bit about your performance background, too, just for my own curiosity. Please come prepared with a bottle of water and a story (approximately 2 pages, 6-10 minutes) that you would like to tell. This is a starting point, it may evolve during class. You may want to bring a lunch, or be ready to go grab something at the break.